A sequel to Ledson’s debut novel, Rough Diamond, Monkey Business sees Jack Jones heading out on another clandestine mission while Erica agonises over the status of their relationship and grows increasingly restless when he fails to return. When Erica realises Jack, and Joe, are actually missing-in-action and no one is willing to help him, she decides to go after him, flying to the troubled island of St Sebastian, where she quickly becomes entangled in some dangerous monkey business. While I enjoyed the improbable but vaguely plausible plot in the first book this adventure didn’t quite work for me. Despite braving the trip to St Sebastian to rescue Jack, once there, Erica mainly wanders around aimlessly, asking random questions and being tortured by a cheerful taxi driver. I would have preferred Erica to be more active in her efforts to find Jack and while she eventually proves herself resourceful, in the depths of the jungle it has more to do with luck than good management. I did giggle at the idea of black market Tupperware, the stuff is now so horrendously expensive that I am in fear of losing a piece of the 1970-80’s collection I liberated from my mother (including that lettuce crisper and the beetroot container). 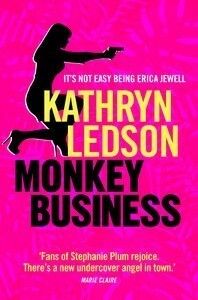 Though not as strong as the first book for me, Monkey Business is a fast, easy read, offering plenty of laughs and I am hoping Erica Jewell will be back. Ooh. I have one of those Tupperwear betroot containers! It has a sort of greenish lid. I agree though, horrendously expensive these days. I read Rough Diamond last year and absolutely loved it … I’ll probably check this one out in the very near future. Black market Tupperware?! Goodness – but then the price of it is super high, so I think there would be some call for it! 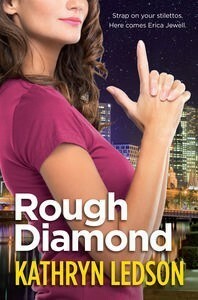 I haven’t read Rough Diamond yet (waiting to borrow from a friend) but I think I’ll try it first. Every time I think I know something about the world it surprises me – this time to learn of a black market in Tupperware! Now going home to check my kitchen cupboard!